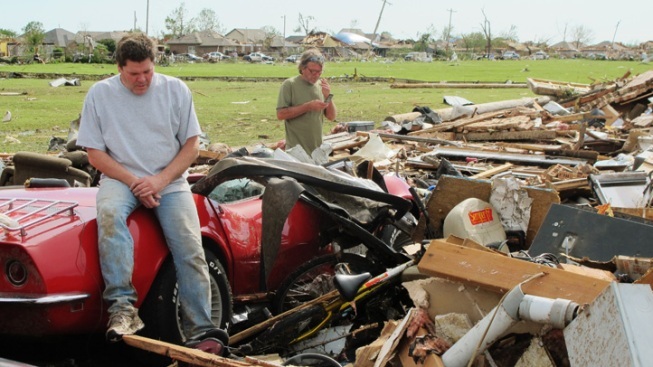 Helmeted rescue workers raced Tuesday to complete the search for survivors and the dead in the Oklahoma City suburb where a mammoth tornado destroyed countless homes, cleared lots down to bare red earth and claimed 24 lives, including those of nine children. 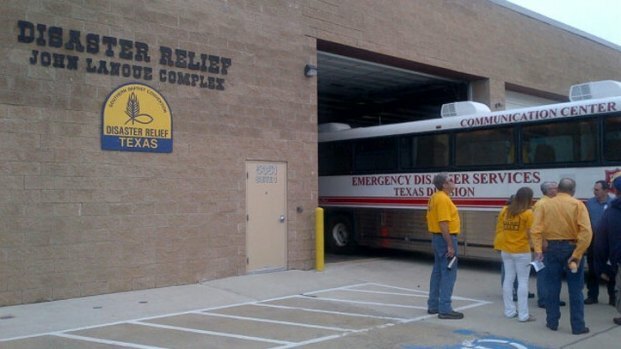 Texas Baptist Men leaving Dallas this morning to help tornado victims in Shawnee, Okla. They did not know how many homes were gone or how many families had been displaced. Emergency crews had trouble navigating devastated neighborhoods because there were no street signs left. Some rescuers used smartphones or GPS devices to guide them through areas with no recognizable landmarks. 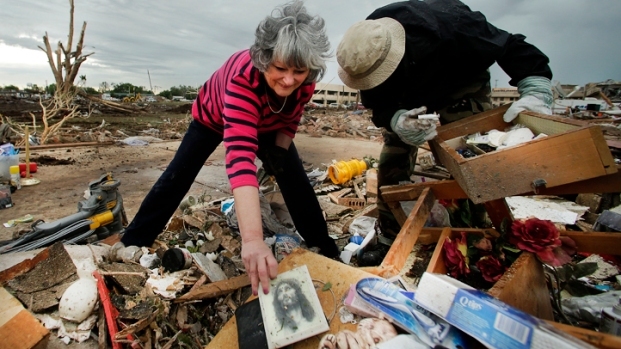 As recovery efforts continue in Moore, Okla., Sgt. 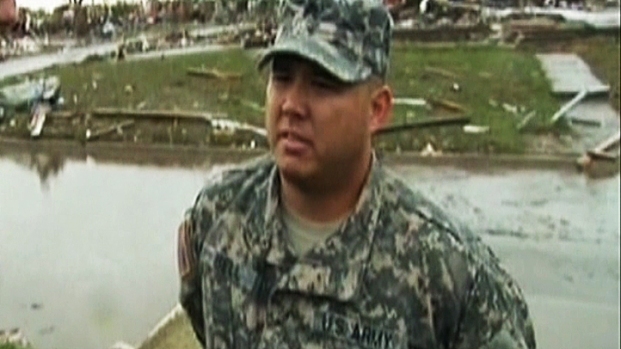 Mike Bell with the U.S. Army Reserve reacts to the tornado devastation. 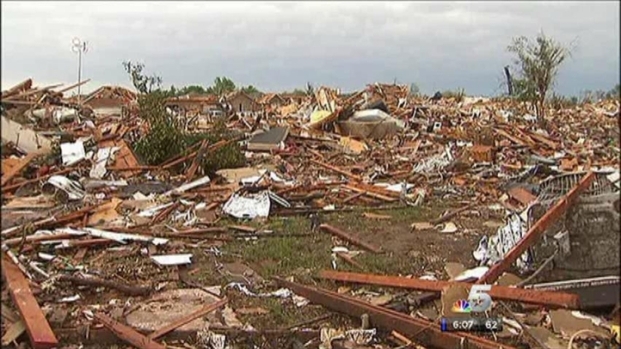 The National Weather Service officially declared the tornado in Moore, Okla. an EF-F with winds that topped 200 miles per hour. The search and rescue mission is ongoing in the area hit by the twister. Also visible were large patches of red earth where the tornado scoured the land down to the soil. Some tree trunks were still standing, but the winds ripped away their leaves, limbs and bark. Neither Plaza Towers nor another school in Oklahoma City that was not as severely damaged had reinforced storm shelters, or safe rooms, said Albert Ashwood is director of the Oklahoma Department of Emergency Management. More than 100 schools across the state do have safe rooms, he said, explaining that it's up to each jurisdiction to set spending priorities. Ashwood said a shelter would not necessarily have saved more lives at Plaza Towers. "When you talk about any kind of safety measures ... it's a mitigating measure, it's not an absolute," he told reporters. "There's not a guarantee that everyone will be totally safe." President Barack Obama pledged to provide federal help and mourned the death of young children who were killed while "trying to take shelter in the safest place they knew -- their school." Moore has been one of the fastest-growing suburbs of Oklahoma City, attracting middle-income families and young couples looking for stable schools and affordable housing. The town's population has grown over the last decade as developers built subdivisions for people who wanted to avoid the urban problems and schools of Oklahoma City but couldn't afford pricier Norman, the college town next door. Many residents commute to jobs in Oklahoma City or to Tinker Air Force Base, about 20 minutes away. Associated Press writers Tim Talley, Ramit Plushnick-Masti and Nomaan Merchant, and Associated Press photographer Sue Ogrocki contributed to this report.